THE JEWEL OF NAVARRE BEACH, THE INN AT SUMMERWIND is a BEAUTIFUL condominium on the Gulf of Mexico. Twenty minutes from Pensacola and Destin, Navarre Beach is the last undiscovered stretch of PRISTINE BEACH on the EMERALD COAST. The East End one bedroom unit (950 square feet) has a beachfront balcony with views to the South to the Gulf and East all the way to Destin.. The totally unobstructed view to the East from just below the Penthouse is wonderful -- public lands, completely undeveloped, showcase the BEACH and COASTLINE as it has always been and will remain untouched! The Navarre fishing pier next door, the longest on the Gulf Coast, extends 1300 feet straight out into the beautiful clear Gulf waters and you can watch the fish, dolphins, and birds from your living room. This comfortably furnished unit sleeps six.. The view from the 20' balcony and living room overlook the Gulf and the pier from right below the penthouse. 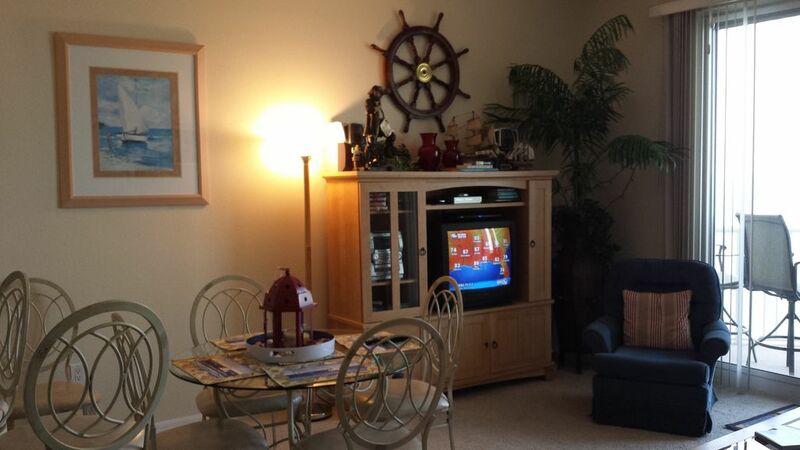 A truly memorable location and very comfortable condominium! The GULF-FRONT one-bedroom unit on the 14th floor of THE INN AT SUMMERWIND is completely furnished and will sleep six, with a king bed in the master which looks out to the Intracoastal, a queen-size sleeper in the living room, and built-in bunk beds in the hallway. Call for rates. Overlooking the pool and huge pier, you can watch the dolphins, see what the fishermen are catching off the beach, enjoy the pelicans cruising by your balcony, and maybe spot a sea turtle or schools of manta rays in the rich coastal water. The beautiful, soft white sand is perfect for building sand castles or relaxing with a book! Tie a kite on your beach chair! A perfect vacation paradise for your family - with 10 miles of bike trails outside the door and nearby along the Gulf Islands National Seashore Park. Terrific restaurants, golf, sailing and other water sports, fishing, and OWNER RATES make this a wonderful beach destination. Call toll free or e-mail Patti for rates, dates, and any other information! Come and ENJOY PARADISE!!! 180 degree view right out your window! East for 40 miles, West for 20 miles and South across the Gulf to the horizon! Immediate access to the famous white sand beaches of Navarre !